AlphaBetter Standing Desk - with bookbox. 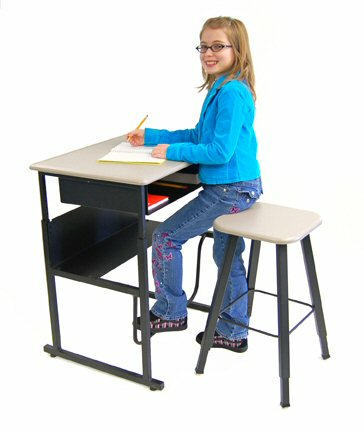 Stand Up For Learning desks are ergonomic, patent-pending student workstations that combine height adjustability with the patent-pending Pendulum™ foot rest. The foot rest allows students to shift weight and expel energy throughout the day. 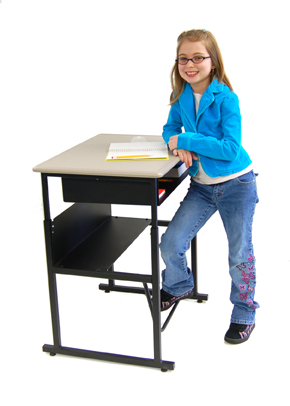 The desk can be adjusted from 26" to 42" to accommodate both sitting and standing applications through a wide range of height differences. Attached bookbox, located directly under the desk top, provides more traditional storage of books and supplies. Pendulum™ (patent-pending) swinging footrest naturally corrects body posture while providing stress relief for the lower back. Desk top: 20"D x 28"W x 5/8"
Desk top: 24"D x 36"W x 5/8"